Each year, Rotary Clubs around the world identify a hands-on project that all members can participate in to help their local community. 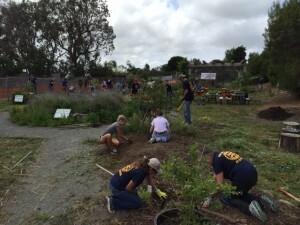 This past Saturday during Rotary International Day of Service, three local Rotary Clubs, Encinitas, Del Mar, San Diego Costal, an Interact Club from San Dieguito Academy, and a several Rotaract students from area Universities teamed up to spend their Day of Service at the Griset Clubhouse located in Encinitas. 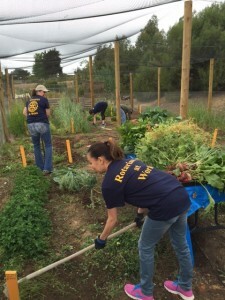 Over 75 Rotarians spent their Saturday weeding, gardening and planting trees in the Club’s 1/2 acre urban farm. 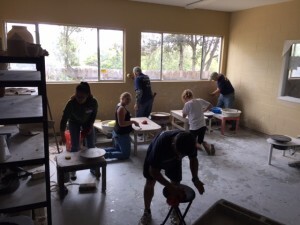 Volunteers also did a deep cleaning of the Club’s ceramics studio. The Encinitas Rotary contributed a grant as well as the Del Mar Rotary to benefit the Boys & Girls Clubs to support their work, and the Del Mar Rotary donated new foosballs, hula hoops, soccer balls, and air hockey pucks to make sure the fun continues! 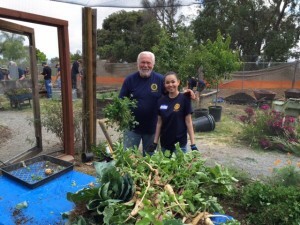 We are thankful local Rotary Clubs chose the Boys & Girls Clubs of San Dieguito as their charity of choice! Thank you to everyone who showed up and got their hands dirty to ensure our kids have a productive, safe, clean place to go after school.